Clock Movements without dial are compact and Quartz-Accurate. Can run over 3 years on one AA size alkaline battery (not included.) Mechanisms include mounting hardware. Warranted 12 months. MINIMUM MERCHANDISE ORDER IS $10.00. Easy Front Mounting - No Power Cord To Deal With. Hour and Minute Hands ARE Included. 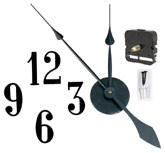 Compact Quartz Clock Movements Include Hands, Mounting Hardware, Hanger and Installation Instructions. with HANDS, Mounting Hardware, Hanger and Installation Instructions. includes gold pendulum and bob, hanger, mounting hardware, gold sweep second hand and metal satin black Classic II Hands with 4-1/16"L minute and 3-1/4"L hour. 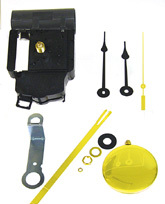 High Torque Clock Movement With HANDS, Mounting Hardware, Hanger Bracket and Installation Instructions. High Torque Clock Movements With HANDS, Mounting Hardware, Wall Mounting Case and Installation Instructions. A) High Torque Clock Movement with Large Hands, Wall Mounting Case & Large Numerals. Wall Mounting Cup is ideal for surface-mounting Compact High Torque, Self-Adjusting and Regular Clock Mechanisms.